I tried to read and research a lot of evaluation agencies online but ECE was my first choice and the application and the entire process was so easy and transparent. I had read negative reviews about ECE.org so I was hesitant to use them at first. I was only looking for the legitimate and reliable ones so the two top choices for me were ECE (Educational Credential Evaluators) and WES (World Education Services). It’s not easy to send your original documents to any credential evaluation service or agency if you don’t know that they are truly operating the legal and legitimate way. 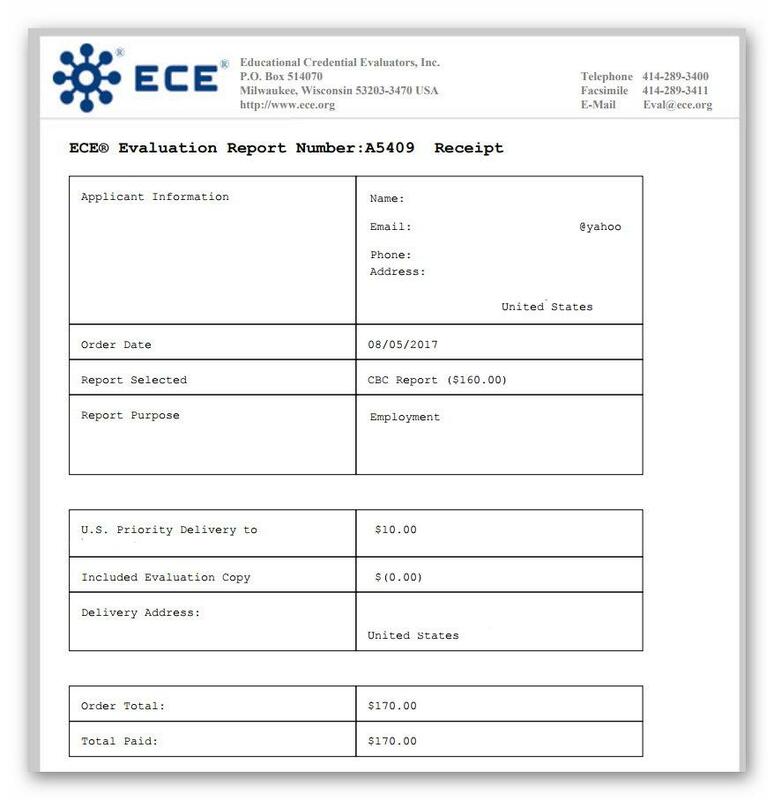 ECE’s “General Report” will cost you $85.00 and this can be used for immigration, employment, professional licensure, or military. This report already includes the U.S. equivalence for each educational credential although it does not include an evaluation of individual courses, grades, or grade average (GPA). The next option is the “General with Grade Average” with the price of $110.00 and this report is used for further education. It includes the U.S. equivalence for each educational credential and grade average for each university level credential. You also need to note that if you have no university level study, a grade average for high school level study will be included in the report. I selected the Course by Course which has a price of $160.00 and this can be used for employment, further education (high school, college or university), or professional licensure. 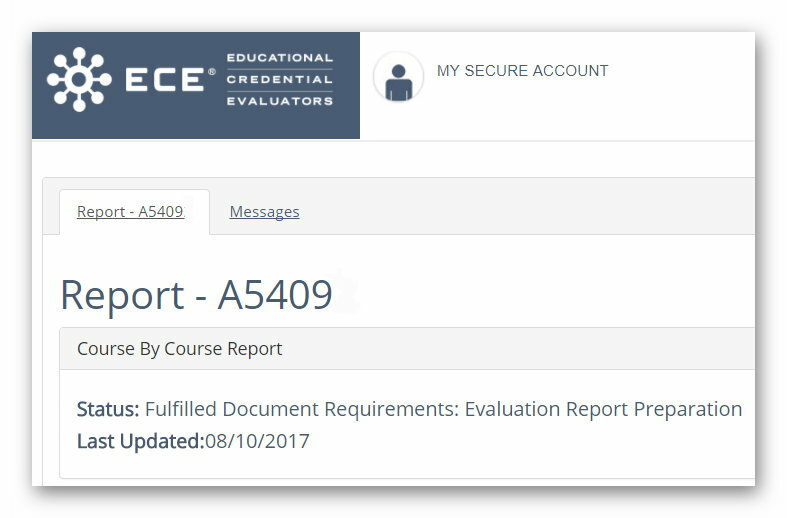 ECE recommends the U.S. equivalent of university level study, so the report that you will receive includes the U.S. equivalence for each educational credential, credit and grade equivalents, and grade average for each educational credential. They will also identify the upper level courses for undergraduate or professional studies and offer general evaluation of high school level credentials (without a grade average), if this will be included for evaluation. ECE has more options and it will depend on what type of educational credential you need for their report. I was glad that I chose ECE since it was truly accurate, fast, and a low-cost foreign credential evaluations based on their expert research. 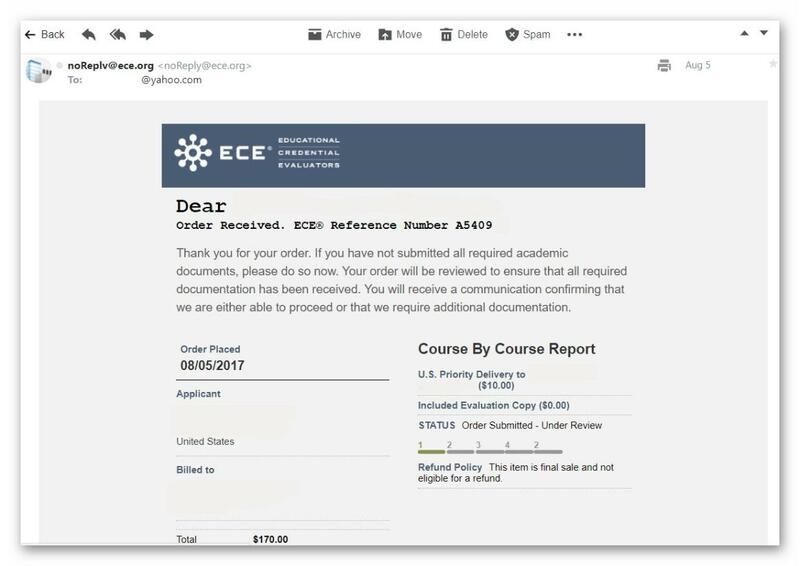 My order was on August 5, 2017 for a CBC Report (Course by Course Report) for only 160.00 with $10.00 U.S. Priority Delivery for a total of $170.00 for my Bachelor’s and Master’s Degrees Evaluation Credential Reports. 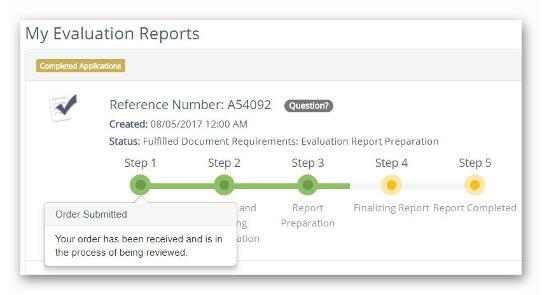 I fulfilled all my document requirements on August 10, 2017 for the Evaluation Report Preparation and it was completed and sent on August 18, 2017. 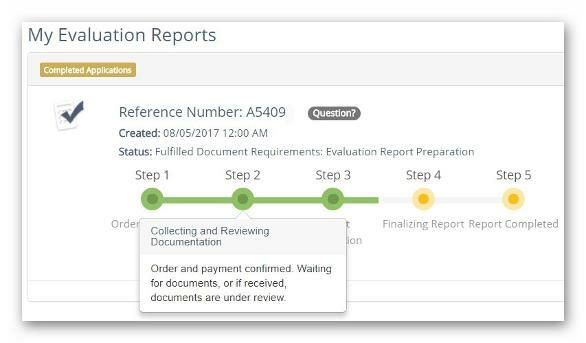 ECE generally complete reports within 10 business days of receiving all application materials although they also offer a variety of rush services in order to meet an applicant’s time frame. 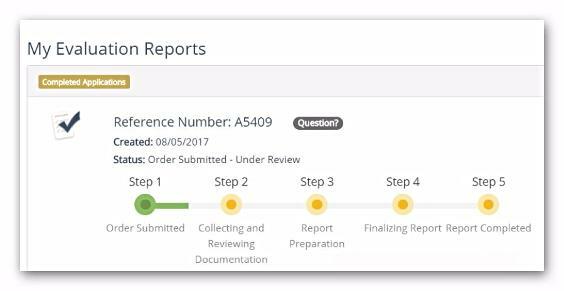 The good thing about their service is that if you’re requesting a copy of your report to a school, the school itself can simply sign up to receive your report and documentation electronically, and this can save mailing time and money. I graduated from the Philippines and I was impressed with the thorough guide that I received through the application process. ECE’s judgement report stated that I had the United States equivalent of a Bachelor degree of my major study as well as my Master’s degree based on the educational documents that was issued in my name. 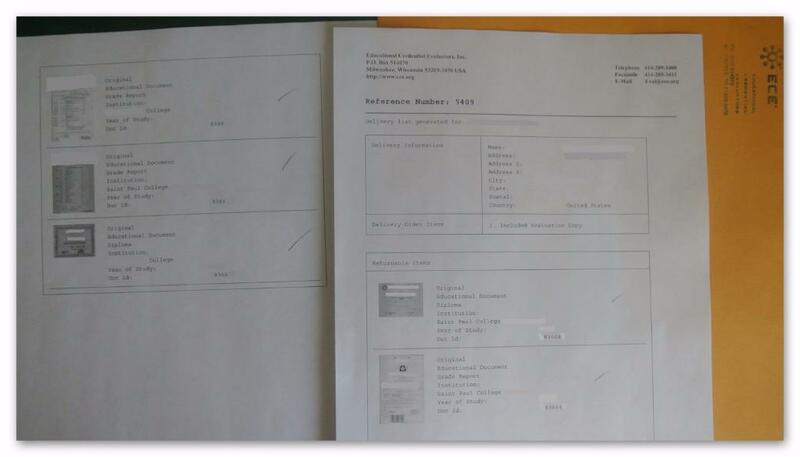 Before I sent my documents, I was confident that they will be able to evaluate correctly my educational credentials because I submitted the exact copies on all of my original documents together with photocopies coming from the university and college where I finished my bachelor’s and master’s degrees in education. I was impressed with the step-by-step instructions that helped me with the whole application procedure. At first, I tried to test how valuable an applicant for them so I called the ECE information desk and was glad that the phone was answered right away. That was important for me. The information desk knew all of my inquiries and answered all my questions promptly without any delay and issues. They responded to my questions/inquiries both by phone and e-mail. They also returned all of my original documents (diploma, transcripts, marriage certificate for the change of name, etc.). But most importantly, they made my education degrees abroad both college and master’s really count. My research did not fail me since ECE was generally among the top list of recommended evaluators and their evaluation cost was indeed affordable plus the process was less complicated compared to other evaluators. They sent me the tracking number for the certificates that they sent out so it’s more helpful to check the location of your pertinent papers. I was glad that every step was updated online promptly. My report was already done in one week and I received my certificates and originals in two weeks. I can truly recommended ECE as an educational credentialing service based on my positive experience with them. I paid via Visa debit card. You can also pay them via MasterCard or in U.S. dollars by money order or check. If the money order or check is issued by a bank outside the U.S., it should contain the printed name of the U.S. bank to which it is affiliated. Take note that a $40 fee will be charged for any returned check. ECE does not accept bank drafts or cash. Jusr be careful since there are no refunds once an application has been submitted. A refund will only be made when an applicant has paid to them more than the cost of the evaluation report that they had issued and this is based on their website as of this writing. There is also no refund when an application is canceled after it has been submitted, or when all the required documentation is not provided by the applicant. Take note that when you pay and start your application, ECE has the right at any time during the evaluation process to request additional information, original educational documents issued in institutionally sealed envelopes, as well as, their own discretion to contact the educational and governmental institutions and agencies for additional information and verification of the authenticity of the credentials that the applicant has submitted. If in any case they determine that the education completed is not the equivalent of the credit course work offered by a regionally accredited institution in the United States, they will issue only a General report of the evaluation, which does not list any courses, credits, including grades. If any report other than a General report was ordered by the applicant, the difference in cost between the report ordered and a General report will simply be refunded. Equivalency conclusions stated in the applicant’s report reflect their judgment based on an in-depth research of applied comparative education but they guarantee that each report will be prepared by their qualified professional staff. According to their website as of this writing, if copies of a report are requested at a later time by the applicant, ECE have no obligation to review or revise the report in accordance with any changes that may have occurred in the interim or the intervening time. Although the fact that there are more than 3000 U.S. institutions of higher education as well as more than 600,000 international students and individuals have trusted their credential evaluation for over 35 years, then this is a big factor why I chose to have my educational credentials evaluated by ECE. All my questions were answered in a timely manner. The nice thing during my application process was the easy access to my information at any time via my secure account evaluation report status online 24 hours a day, and they'll send regular updates on my order as well. Please take note that in order to ensure that their evaluation reports reflect their current equivalencies and documentation standards, ECE will be changing their policy of issuing copies to any applicant. This recent policy change will go into effect on March 1, 2018. So this means that until March 1, 2018, any applicant will be able to order copies of the evaluation report for 10 years after the report was first issued. According to their website, if the report was prepared more than 10 years ago, you will need to re-apply and pay for a new report. 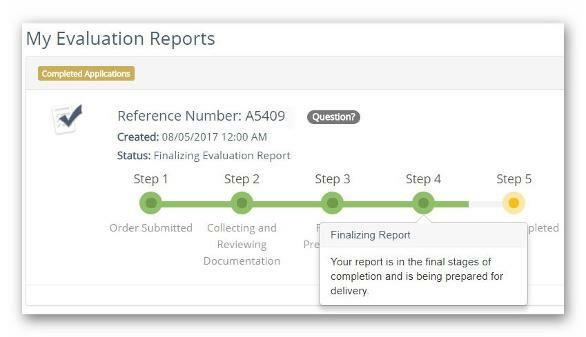 So starting March 1, 2018, any applicant will be able to order copies of the evaluation report only good for 5 years from the date on the report. This only means that if the report was prepared more than 5 years ago, that applicant will need to apply again and pay for a new report. ECE is a charter member of the National Association of Credential Evaluation Services (NACES), an organization incorporated in Delaware in 1987 to establish and maintain professional standards for private credential evaluation services. It’s important to choose an evaluator that is affiliated with an association like NACES, since they can ensure the quality and reliability of a credential evaluation service. I’m not affiliated with ECE but I know that their experience enables them to verify the official status of an educational institution, and to validate the authenticity of the educational credentials of an applicant. I was truly happy with their service and that’s the reason why I wrote this article.